Beyond personal history and archetypal themes, a comprehensive psychology must also address the fundamental significance of birth and death. Stanislav Grof, M.D., renowned for his pioneering contributions regarding the psychological and spiritual aspects of the birth process, now adds invaluable insights from more than half a century of research and personal discovery into the experience of death and dying. Dr. Grof distills teachings from ancient wisdom and modern science that suggest how to face the process of death and dying. The ultimate journey challenges us all, and how we approach it is much more than major personal issue. Those who come to terms with death in deep experiential self-exploration tend to develop a sense of planetary citizenship, reverence for life in all its forms, and spirituality of a universal and all-encompassing nature. Such radial inner transformation might be humanityís only real chance for survival. The Ultimate Journey describes ancient and aboriginal ritual and spiritual practices that help us understand the experience of death, develop effective ways of making dying easier, and integrate it as a meaningful part of life. 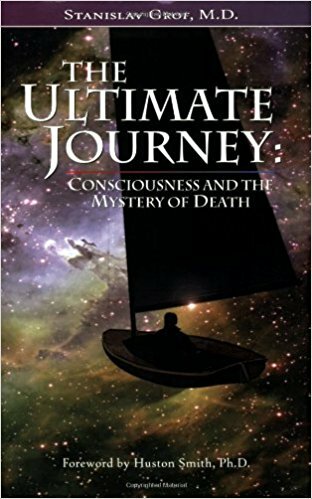 The book also summarizes modern studies that shed new light on a variety of phenomena related to death and dying, including psycho-spiritual death and rebirth, near-death experiences, and the new expanded cartography y of the psyche that has emerged from Grofís fifty years of research of psychedelic therapy, Holotropic Breathwork, and spontaneous psychospiritual crises.